Do you know what it’s like when you’re served with a large buffet spread and don’t know where to begin? That’s exactly how I felt this past month. There were too many topics to write about which either aroused my emotions or interested me. So instead of writing one article for each, I’ll just skim through some of them with my thoughts. 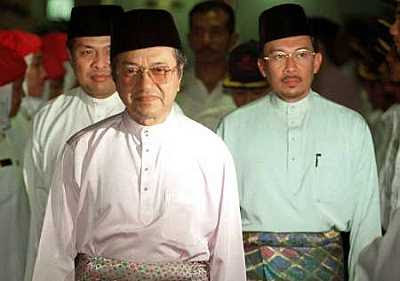 Just before the UMNO Assembly, former President Tun Dr Mahathir appeared on TV3’s “Soal Jawab” program and in one segment implied that UMNO members today are in the party to either gain wealth or constantly chasing after contracts. While I concur that, to a good extent to be correct, I would have also appreciated it if Tun qualified his statement by saying that there are still many of us who are in it to serve and have spent personal funds derived from earnings that did not come from government contracts, unlike many of those who’ve amassed their wealth because of their father’s or father-in law’s positions in the Government be it as either Prime Ministers in the past or current advisors to Government owned Fortune 500 Companies and GLCs. 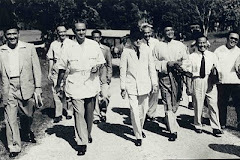 Tun The Icon With His Ex-Protege And His Ex-Protege's Protege "At One Time"
Past UMNO leaders condemning UMNO members for a failed system which they themselves created, is no longer cute to read nor listen to anymore. If I weren’t serving the multiracial rakyat under UMNO for the last 22 years, I would be driving two Bentleys and an Aston Martin today. And I know for a fact that there are many more like me who still uphold the true values of being a servant to the people under the Party as when it first started. We shouldn’t condemn the UMNO man at large with silly generalizations egging on the opposition and those on the fence to follow suit. Instead, let us audit the family members of those who have held high positions in the party and government and see if they have benefitted financially through government contracts being related to these personalities. (Ex-UMNO leaders now in the opposition included). A classic example on the current is the NFC fiasco. I think the facts have more or less sunk in since it first came out in the Auditor-General’s report. Let me reiterate, it was the A-G, under the transparent Federal Government who highlighted the matter, which was capitalized by the opposition making people think that it was the latter that introduced it. 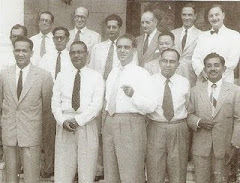 Tun Has Achieved More Good Than Not For Us, But I Leave This Picture Above For You To Measure The Weight Of It's Good, Or Not. 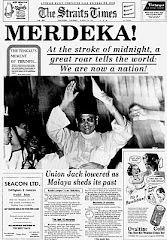 My question to Tun Dr Mahathir, (whom I still admire for the greater good that he has achieved for Islam, this country and our generation) and many other cynical UMNO observers is, would it have been that easy for an ordinary UMNO member with equal experience to get a soft loan to the tune of RM 250,000,000.00 on a similarly proposed project? In the words of the great gentleman himself “You can wait till the cows come home” (no pun intended), and you still won’t see a sen of it. What irked me the most was Sharizat Jalil dragging UMNO into it in the beginning, by saying that this was an attack on Wanita UMNO when it had nothing to do with the Wing, nor the Party except for the fact that by coincidence she was also the Wanita Chief besides being the wife of the Chairman (which is now her stance when her back is against the wall), and mother of the executive directors of the company involved. She would have been more correct had she said that it was an attack on her family since none of the Wanita UMNO members neither sit on the board nor enjoy any of the luxurious perks. Alas, we shall see the outcome of the thorough investigation and leave it at that. But at this point in time, I say to Prime Minister Najib Razak, if Dato’ Seri Sharizat Jalil is considered a "winnable" candidate in the coming elections, then so is my Norwegian cat at home. 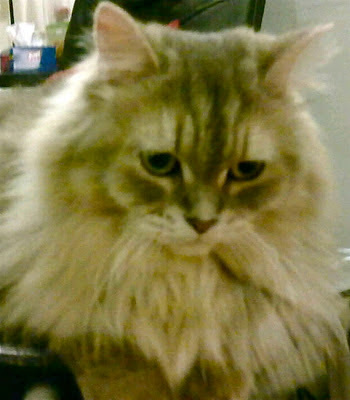 She’s As Winnable As The Other “Cat”! And to our ignorant and un-enterprising journalists covering politics, it is not the Cabinet or anyone else who decides the fate of Sharizat as Minister, but the Prime Minister himself. So learn to ask relevant and clever questions to the Deputy Prime Minister and those below him pertaining only to the their respective ministries and power without treating every facet of reporting like a trashy entertainment gossip page, getting information even from the make-up “artist” for things that don’t concern the creature just to look like you are doing your job! My advice to HRH is, if you make a statement, leave no ambiguity for skewed interpretations and stick by it, or forget about fondling with it in the first place. Making snide remarks on Malay leaders and UMNO members and repeating it in a questionable apology in a Chinese run newspaper while living under the blanket security, privileges, luxury and comforts of which UMNO and its struggle protects and provides, is considered bad form. 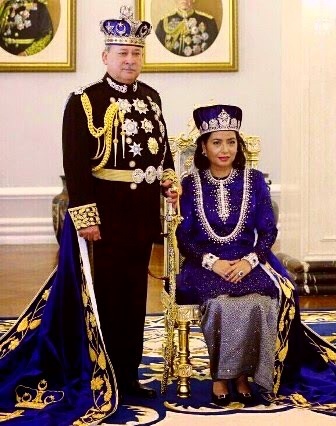 Allowing a minor Princling from a Malay Royal Palace acting like a Chinese stooge condemning UMNO members in an MCA owned newspaper also exhibits the latter’s fake interest in wanting to see Barisan Nasional succeed as one unit in the next general election. 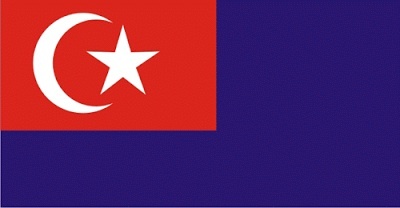 I see a resemblance in attitude with the DAP using Malay stooges for their purpose in Selangor and previously in Perak. 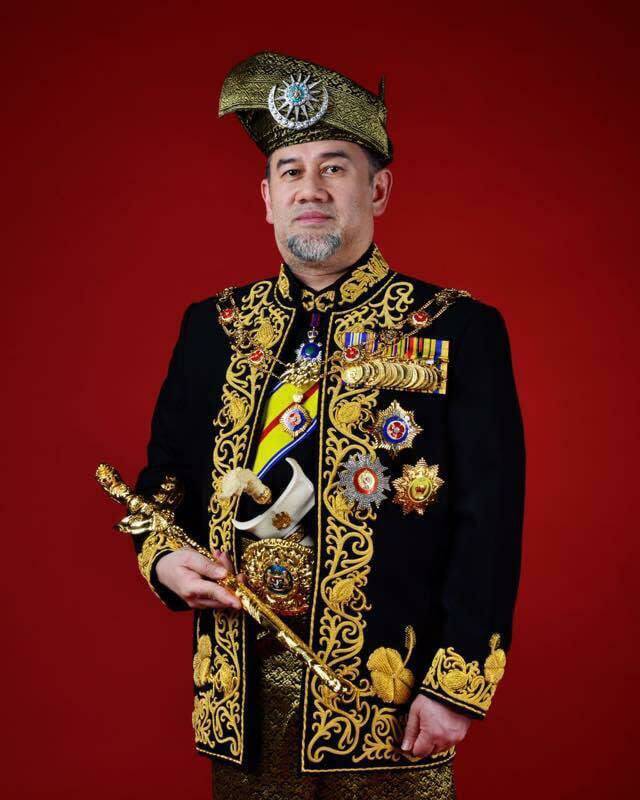 Ironically, Malays of such character sometimes are picked by UMNO leaders as consultants bypassing their own pool of intellects, presumably for their “bright” thinking, which doesn’t reflect well on the intelligence of the person appointing them. I must say, this is the first time for me seeing a “fairy” in a Malay warrior’s outfit. It reminds me of a local screen siren Saadiah in one of the classic Malay movies, cross-dressing stabbing her “kris” on the enemy. 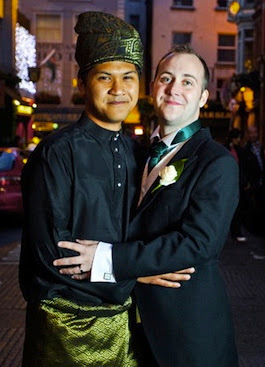 This Malay homo on the other hand is taking a stab at Islam and the Malays by being united with his boyfriend in a public ceremony that is considered sacrilegious and against Malay Customs. “To Stab Or Not To Stab.” Who’s Turn Is It Tonight Sunshine? Again, I would prefer to leave one’s sexual orientation and preferences between one and one’s maker but take umbrage if one parades it to the world mocking God’s religion and the Malay tradition. If indeed this “unisex” (best to watch out for unisex products like perfume etc. at the stores lest you might end up like this creature) has gone AWOL with his scholarship, then legal effort should be made to bring him to justice instead of sending people to bring him home for counseling incurring further costs to the taxpayers. 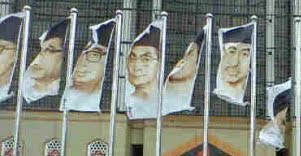 The juvenile behavior of student Adam Adli who was clearly made a lackey by the opposition party by bringing down the flag bearing the PM’s resemblance at the UMNO headquarters, while delivering a memorandum to the government has proven that the body may not be ready to embrace the freedom that they may be given to participate in politics soon enough. Gross Injustice On Najib. Could This Be The Result Of Giving Too Much Face? Even if they are ready, Adam has severely tarnished the good effort made by the collective student bodies to achieve their goal, getting the government to compromise. We shouldn’t penalize the movement, but should drive the full weight of the laws and regulation provided governing the students, on persecuting Adam for his outrageous behavior. We expect the Minister in charge to deal with the action personally while his Deputy continue to engage with the various student bodies positively and separately. We also expect the head of security at the PWTC to be taken to task for his officers’ ignorance and “spectatorial” attitude in line of duty. A property of the PWTC was removed and replaced under their watch and nothing was done to accost the perpetrator. Lately, We Have Many Complaints And See Numerous Shortcomings From Our Half Of The Playing Field. When Will We Ever Account For Them And Take Positive Actions Preventing Similar Outcomes In The Future? Najib And Muhyiddin Can’t Do Them By Themselves But What They CAN Do Is To Appoint The Right People For The Right Positions! Accommodation Is Not The Answer! Precise Designation Is! Your article are so daring but very truthful. You've concluded everything in one simple and short but full of facts. You're a true UMNO man. Your late father contributions still fresh in my mind. Let his spirit arouse you and become the true fighter of UMNO and our country. Please dont give up. Your words, your actions and even your blogs has been monitored closely by the 'Malaysia Guardian Angels'. With all the supports. Never give up. Please be with the office to transform Malaysia for a better place to lives. The PM and his Deputy need people who speak the truth, not polishers and poets to rhyme them the tunes of merry melodies. Yes! 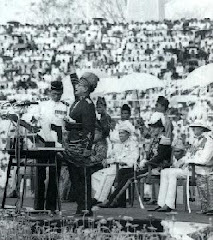 I'm an UMNO man, not because my father was one but because the party upholds the spirit that brought us unity and independence; to stand on our own two feet and forge our own future together. UMNO has delivered and is a proven Party that drives this country forward. My late father didn't teach me about politics. It was the hardship I saw in our people that taught me first hand about politics and how UMNO serves and operates and for that I thank the Ketua Cawangans and local leaders. 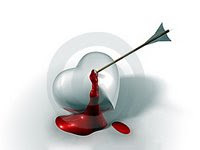 Perhaps if anything, it is the blood that flows in my vein that drove me to it subconsciously. Yes, I am with the office, but the question should be, is the office with me and all the other loyalists with reasonable intelligence? Does it take us for granted bypassing us for people who were at odds with Government policies which WE defended with every tooth and nail available?